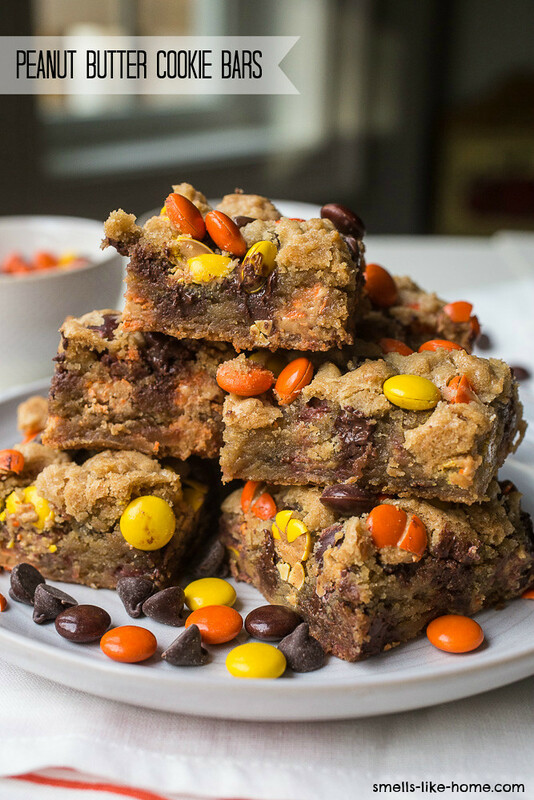 Peanut butter cookie bars – Easily turn chewy chocolate chip cookies into cookie bars and load them up with Reese’s Pieces for a mindblowing dessert. There are times when I agonize over what to bake. I’m a terrible decision-maker; too many choices destroy my ability to swiftly decide. It’s probably the reason why I cut my to-make lists down a few weeks back to a much more manageable size, deleting things I was no longer interested in, that no longer got me excited. These peanut butter cookie bars, however, never left the list. They have remained an incredible dessert bar I’ve been meaning to share with you for what seems like ages (really, just since July though) and I finally remade them this weekend as a treat for our spooky night at the drive-in. 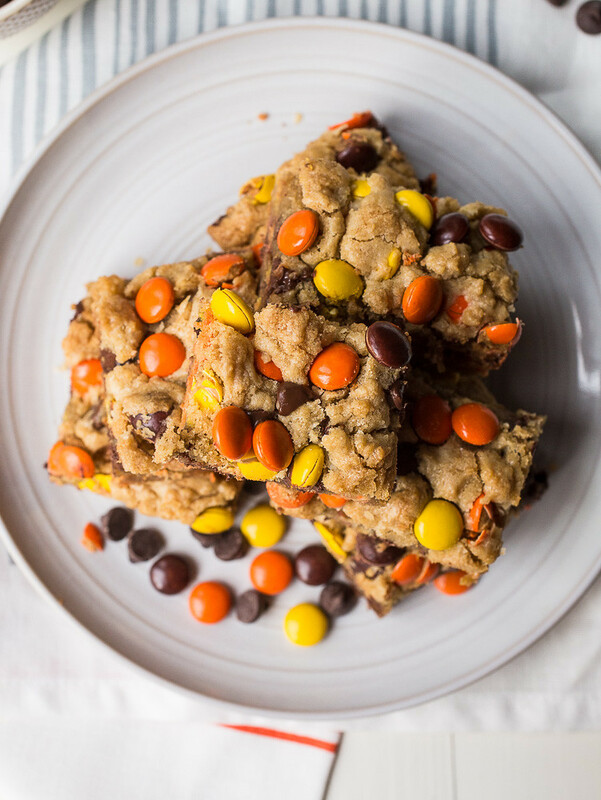 And truthfully, there are a couple of reasons why I chose these bars for our movie night: 1) We don’t go to movies without Reese’s Pieces and 2) aren’t these cookie bars just the perfect Halloween dessert?? We actually don’t take road trips without Reese’s Pieces either (not even kidding) which is why the first time I made these bars was back in July for a special boat trip in Maine with friends (more on this coming soon – promise). These cookie bars were such a major hit that night in July that I was strongly urged to share them here. The funny thing about them is that while they taste like the most amazing peanut butter cookie bars you might ever eat, there’s no actual peanut butter in them. Well, no actual scoop-from-the-jar peanut butter anyway; all of the flavor comes from those magical Reese’s Pieces. In any event, their a cinch to pull together with one bowl and a wooden spoon like I did in our rental house kitchen a few months ago. You’ll plop the dough into a baking pan and bake for 35-40 minutes. There’s nothing fussy about them and I suspect they’ll remain a family favorite of our for ages. 1 cup Reese's Pieces candies, plus extra for "garnish"
Using a wooden spoon and in a large bowl, beat the melted butter with the sugar until the butter is incorporated. Mix in the egg, yolk, and vanilla until well-combined. Measure the flour, baking soda, and salt into the bowl and stir until just combined and only just a few flour streaks barely remain - the dough should look a little dry. Fold in the Reese's Pieces and chocolate chips until they are just incorporated - do not over mix as this will cause the bars to deflate in the center of the pan. Dump the dough into an 8x8-inch baking pan and spread it out with your fingers. Don't press the dough down, just roughly set it in the pan. Toss a few more Reese's Pieces over the top of the dough before baking. Bake for 35-40 minutes, rotating the pan halfway through the time. Darker pans will need closer to 35 minutes so watch them carefully. The bars will be done when the center no longer jiggles when the pan is gently shaken. Allow the bars to cool completely in the pan on a wire rack before cutting and serving. Bars will keep for 2-3 days in an airtight container at room temperature. If peanut butter isn’t your thing (are we even friends? ), M&Ms of virtually any variety will work great here too. Using a wooden spoon and in a large bowl, beat the melted butter with the sugar until the butter is incorporated. Mix in the egg, yolk, and vanilla until well-combined. Measure the flour, baking soda, and salt into the bowl and stir until just combined and only just a few flour streaks barely remain – the dough should look a little dry. Fold in the Reese’s Pieces and chocolate chips until they are just incorporated – do not over mix as this will cause the bars to deflate in the center of the pan. Dump the dough into an 8×8-inch baking pan and spread it out with your fingers. Don’t press the dough down, just roughly set it in the pan. Toss a few more Reese’s Pieces over the top of the dough before baking. uh yeah these are PERFECT-so simple and peanut buttery and delicious!